A BUBBLING CAULDRON: FISH FRY WEEKEND! It's that time of the year again! Time to visit Lions Park for the 63rd version of the Lions Club Fish Fry. Fun, games, rides, beautiful baby contest and, of course, that yummy "secret recipe" fried cod and french fries! Heck, you might even see some local celebrities deep-frying fish and fries if you look closely. 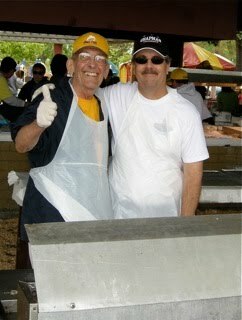 Members of the Costa Mesa-Newport Harbor Lions Club begin setting up tomorrow morning and will begin serving that lovely grub, as my father-in-law used to say, on Saturday at around 11 a.m. until 8 p.m. Sunday the food will be served until around 6:30 or until they run out of fish. Rides begin Friday night from 6-10 p.m and run Saturday and Sunday from 11 a.m. until 10 p.m.
Come help renew this tradition and support the many good causes the Lions Club funds each year. 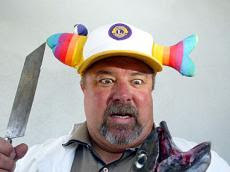 Heck, you might even see the "Fishmeister", Mike Scheafer wandering around in his fish hat, below.